Visit the city that never sleeps for a full day of fun and excitement. This one-day round trip starts from Philadelphia 30th Street Rail Station and takes you into the heart of New York City. Once you arrive at Pennsylvania Station, you'll be ready to hit the city for sightseeing, shopping and dining. 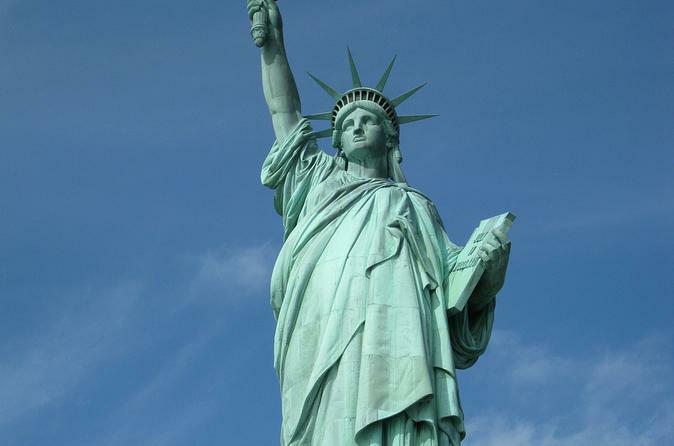 See the Empire State Building, Statue of Liberty, Ellis Island, Freedom towers and much more. You will also enjoy a VIP lunch at a local Times Square restaurant. Enjoy a day in New York by taking the railroad. Leave the tolls, gas and traffic problems at home while you relax aboard at Amtrak Regional train. Take a nap on the comfortable roomy seats or stop at the Café Car. By mid-morning, you'll arrive at Pennsylvania Station. From there, it's just a few blocks to pick up your included hop-on hop-off tickets for a memorable double-decker tour of New York and Brooklyn. Pick from a variety of loop tours. Stay on the bus or hop off at the stop of your choice. There is something to do at nearly every stop. Experience the fun of museums, observatories, theaters, zoos, and boat rides. Children and adults will enjoy the famed WWII aircraft carrier, Intrepid, and its new space shuttle exhibit. Alternatively, head to the new One World Trade Center Observatory with a stop at the 9/11 Memorial Pool. A short walk from there is the American Indian Museum and Fraunces Tavern - which served as George Washington's headquarters during the Revolutionary War. Stop in front of the Stock Exchange. Across the street, you'll see the historic Federal Hall - built as a Customs House in 1842 and previously the site of George Washington's inauguration as the first President of the United States. With all this touring, you'll be ready for a hearty 2-course lunch at a local Times Square restaurant. Macy's flagship store is located just a few blocks from Times Square. From there, you'll only have to walk 3 blocks back to Penn Station for your return trip home.